Truth be told, I’d really like to hear this course description from a local- up in Dover, NH, who really plays Bellamy on a regular basis. But, that being said I’ve played the course a handful of times and really started to enjoy some of the holes. 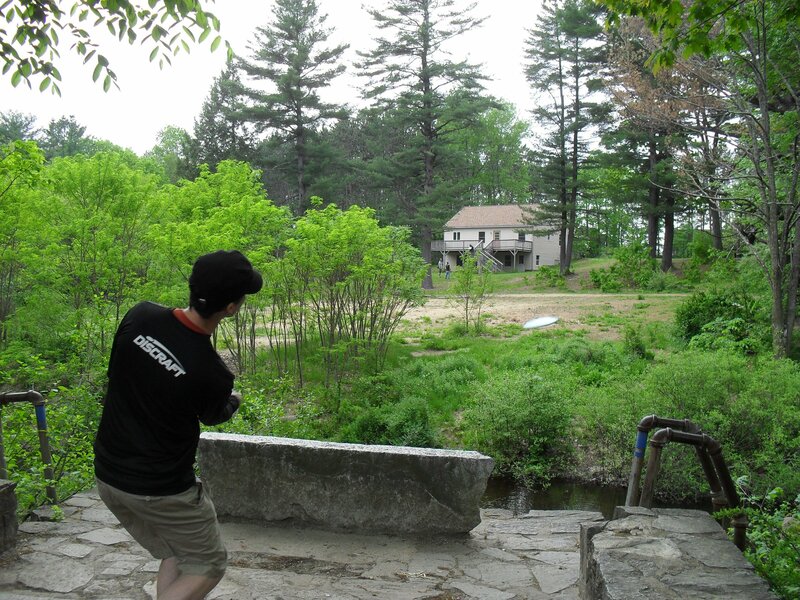 Starting off with a definite “signature hole” you throw from off of an elevated stone embankment right next to a river. Getting over the water isn’t too difficult, but if you hit a branch it COULD conceivably happen. It isn’t so much the challenge of this first hole (although there’s a hyzer route on the right that’s worth exploring, and you seldom see it used!) as much as the scenery. The river/stream comes into play on a handful of other holes in pretty creative ways. On hole 11 you’re actually throwing directly AT the river, with the basket only about 10 feet from the edge: making not only the drive, but also any approach or putt a little ‘hairy.’ The very next hole, #12, you’re throwing a left to right shot with the river on your left. This challenges the player, especially the right handed back hand thrower, to throw with control more than distance- as nobody wants to lose plastic in the water (this being the kind of water you may not always successfully rescue plastic from). There are a couple forgettable holes, but they incorporate so many trees that they’re never really “gimmies.” I’d guesstimate that the course is just about divided up into three sections (not in order, just percentage). One part simple par 3’s. One part incorporating water (the stream, river, or swamps). Finally the last part, which is my personal favorite, par 4’s. Even if some of the par 4’s really play like a ‘difficult par 3,’ they’re still much longer than a typical par 3. New England courses, at least eastern Massachusetts courses, are often lacking in the distance department, and getting a solid birdie 3 on a par 4 can be a touch more satisfying (after all, a short par three can be a simple well executed drive/park job, and is a little too easy at times). Also, as sort of an addendum here, the course is free, the parking is free. The baskets are in great shape, and the tee pads are average to above average. It is very easy to navigate from hole to hole. These are the things that you take for granted- but when you don’t have them it sort of weighs you down. So, in any case, there are no such weights at Bellamy Park. If I had to point out the negatives, I’d say that the trash is a bit of an issue. There are barrels at many tee boxes, but they’ve been full every time I’ve played, and there are cigarette butts and beer cans scattered at times. They don’t bother me too much, but their absence would probably take the course up a notch, and make the scenery a little better. In all, I’d like to give the Bellamy Park Disc Golf course a B+. This entry was posted in Course Highlights and tagged bellamy, course, disc, dover, golf, nh, park, review. Bookmark the permalink.